"Tech hub" on the High Street, consisting of desk/office space and a cafe. 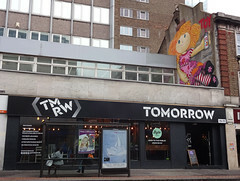 It opened in May 2016. The cafe is open to the public. Accessibility to Byte Cafe: A huge step to get in. They do have a portable ramp, but there's no doorbell. Even so, the only normal-height seating in the cafe is up a couple of steps; all other seating is at high tables. Accessibility to workspace: There is step-free access to the TMRW workspace, but it involves steep slopes and is very convoluted. From facing the front of the building, turn to your right, then take the next left (Robert Street; steep slope up). At the end of the street is a barrier in front of a car park photo; press the intercom button here to have the barrier raised. Go down the steep slope, turn left, and head for the ramp leading to the back entrance of the building photo. There's another intercom button here photo for access to the building. Once inside, take the lift to the first floor. There is an accessible toilet photo next to the workspace entrance. It was vacant as of July 2012, and being used as a building site entrance for the construction of the new Croydon Council offices (Bernard Weatherill House). As of October 2013 it was still vacant, and being advertised to let (the council offices had been completed). Still vacant as of April 2014. Still vacant as of November 2014. Still vacant as of May 2015. Still vacant as of July 2015. Still vacant as of December 2015. As of December 2015, planning permission was granted for use as a "tech hub" including office space and a cafe. This opened as TMRW/Tomorrow/Byte Cafe in May 2016. Existence last checked in February 2019. Last edited 2019-02-07 16:27:46 (version 41; diff). List all versions. Page last edited 2019-02-07 16:27:46 (version 41).